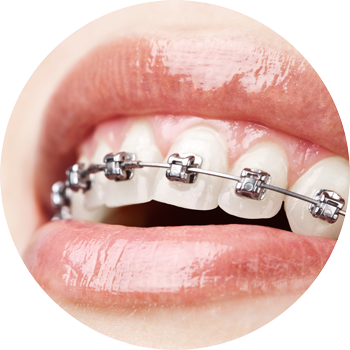 Orthodontics is the correction of teeth alignment or the jaw bone form with braces in both adults or children. Most of our centres offer orthodontic treatments. Orthodontists are specialized dentists. The position of teeth and the jaw as well as their form vary by nature. Through orthodontic treatments both esthetics as well as functionality can be improved. Beautiful teeth in a good position improve your self-assurance and let you smile light-heartedly. Teeth are an eye catcher. The treatment is done by application of dental braces over a prolonged period of time. How long time the treatment will last varies and depends on the complexity of the straightening in each individual case. The bracescan either be fixed or removable and will be applied either invisibly on the tooth inside or outside. Together with your orthodontist the best solution for your case will be found. This method is used primarily on children and is more cost-effective. Brackets will be glued to the outside of the teeth which will be joined together with a metal wire. This wire will be indivudally adapted and changed several times over the course of the treatment. In many cases our orthodontists can improve your smile with invisible tools. These are used for esthetic reasons and applied mostly to adults. They are more expensive than the visible braces but are equally effective. There are several degrees of invisibility. Here the teeth will be corrected from the inside using orthodontic devices from the Incognito brand. Malocclusions are corrected with Invisalign based on a 3D treatment planning your dentist, through a series of custom-made aligners for you. These removable rails are almost invisible on the teeth. Every two weeks you put a new aligner a pair - and little by little, week by week, your teeth move to its permanent location. Traditional braces are combined with brackets made of ceramic instead of metal, which makes this method less visible than purely traditonal braces.